International Table Tennis Federation President Adam Sharara has sent a congratulatory message to Mr. Andrew Mudibo on his election as Kenya Table Tennis Association (KTTA) Chairman. In his message, the ITTF President congratulated Mudibo and the entire KTTA team for winning the election held recently at the Kenya National Sports Council (KNSC) boardroom at Nyayo National Stadium. In his message, the ITTF President said that he had known Mudibo from when he was young and has been following his exploits in the sport. 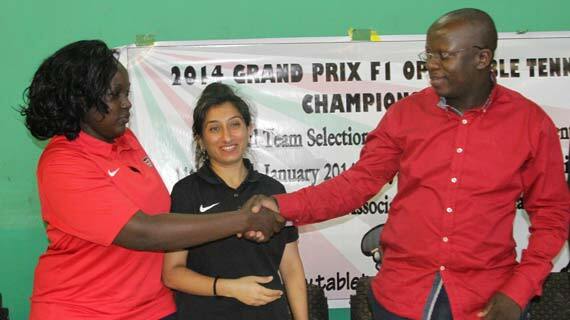 He urged the new team to work hand in hand in their bid to steer the game of table tennis in Kenya to greater heights. Mudibo, who served as the Association's longstanding Secretary General, defeated Francis Gichomo 10- 4 in an exercise presided over by KNSC and National Olympic Committee of Kenya. During the election, Mudibo's line up made a clean sweep of the seats in the executive committee. A total five provinces- Nairobi, Central, Coast, Rift Valley and Nyanza participated in the election. Representing NOCK were Ben Ekumbo and James Chacha while KNSC was represented by its chairman Nderitu Gikaria, member Anthony Kariuki and Administrative Secretary Richard Ombeba. The Elections were conducted through a Court Consent order of 22nd November 2013, whereby the Jane Pinto group and Francis Gichomo's group agreed to elections being held on the 25th of January for Branches and the National elections to take place on February 8. Also elected to the new team was multiple Kenya champion Fahd Daim who won the post of Secretary General and Madhu Gudka who took over the mantle in the treasury's docket. Madhu replaced Dilshad Kanji who was elected an Ordinary Member for the Council. Mombasa based CTTA Chairman Mariga Mwangi is the new vice chairman. Thika based John Gicaci, a career accountant, was elected the assistant treasures while former player Paul Mulandi was elected unopposed as Fahd's deputy.